These days, integration in any area, be it STEM or the arts, seems to be the buzzword to curriculum designers everywhere. There are so many resources floating around out there with the claim of integrating content areas. Yet, true integration is often difficult to find. Indeed, integration is a rare yet seemingly "magical" approach that has the capacity to turn learning into meaningful practice. So far with Common Core, the often-highlighted integration approach is through STEM. However, Arts Integration is just as effective yet many times overlooked. What is striking is that both STEM and Arts Integration are linked through definition as an approach to teaching through two or more content areas. Still, the arts have some unique parallels to the Common Core Standards that may make their implementation a beneficial addition for teachers and administrators. These parallels attest to the rigors of the arts and the need for their processes in today's global workforce and the unforeseen future. I developed many of these Arts Integration lessons which provide students with time to compare sources, conduct research and focus on the process of their work. The products created are naturally richer and more extensive than from a "traditional" approach. The importance of shifting our focus from products to processes can be found within the Common Core Math Practices -- most of which are aligned with the Artist's Habits of Mind. An Arts Integration approach is naturally engaging to students and to teachers. Almost everyone has one art form (visual art, music, dance or drama) with which they connect and use to make sense of the world. And our society places a high emphasis on the arts. We are bombarded with advertisements for iPods and iPads, music, movies and shows that are often produced with high visual impact. By weaving the arts into and through our content in naturally aligned ways, we are providing relevance to student learning, and giving them an opportunity to connect their world to our classrooms. The emphasis on process-based learning and using access points that are relevant to every child makes teaching and learning an equitable opportunity for everyone in the classroom. 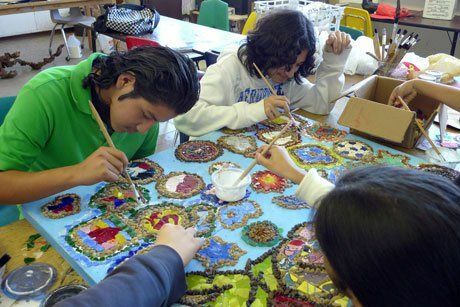 By using Arts Integration, teachers and leaders can ensure that students are learning in a way that meets their own unique cultural, social, emotional and intellectual needs. When studying any piece of art, composition, drama or dance, one must be able to analyze the components that create the whole. Additionally, the ability to synthesize these parts into a whole work is critical to making meaning for each audience member. Common Core Reading and Math Standards have both identified the need for this critical practice, and many teachers are struggling with implementing it in the classroom. Arts Integration may be a pathway to providing those opportunities. A drama and dance technique, this is a fantastic way of connecting to Common Core Math Standards. It provides students with a way to share understanding using movement, concentration and problem-solving skills. This technique involves partnering students and having them "mirror" each other’s actions. This music technique is practiced all the time in general music classes as a way to build improvising and composition skills, and to practice fluency. It can be used effectively with reading or math concepts and, because it is rhythmically based, the classroom teacher can guide the exercise with simple handclapping. Arts Integration is about the tools that we use to provide the opportunities for teachers and students to create their own meaning. By taking a traditional approach, we are shortchanging our teachers from the true art of their craft. This leads to burnout and resentment, which we desperately need to address if our students are to succeed. And our students deserve an opportunity to own their learning for themselves and to make deep, meaningful connections through the curriculum. Arts Integration allows us to build chefs who make choices -- not cooks who merely follow the recipe. By fostering a community within our schools where authentic Arts Integration is taking place, we can meet and exceed expectations set by Common Core and move into a culture of true inquiry and learning.